it has some difficulties with paypal, its account is blocked. there is no payement processor in the site so no way to cashout. http://www.addwallet.net/?id=daianapotter <--- very similar to zeek http://paradoxcash.com/?cash=456 <---- be a founder for only $4!!! 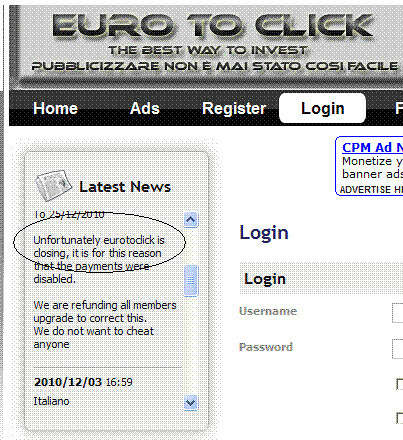 what about paying from his personal PP account, because account made especially for euro3click has been blocked??? btw, he is first ptc admin who said his users what reasons have to close, and refunded guys who buys upgrades. and... he said right: "i can just go away with money, if i runs this site to scamming you!!!"